A special thanks to Regalo for partnering on this post. As always, all opinions are my own. This post also includes affiliate links to Amazon. While these do not cost you more to use, they help provide Veggies & Virtue with a small commission from Amazon to support my ongoing efforts and mission. For more info, please visit my legal page. Many of you might remember this past March when my four-year-old very innocently and far too easily broke her leg while jumping on a trampoline. While much could be said about if/whether kids should be on trampolines at all (especially if/whether adults should jump with them! ), that's another topic for another day. It was an unfortunate situation but also a reminder that accidents will happen and as parents, it's best we be prepared for how to stay positive when they do. That's why I wanted to gather my thoughts and create "A Parent's Survival Guide to Having a Kid in a Full Leg Cast." Over the past few months, I have had multiple parents who have reached out wanting advice on how to handle having a child in a full leg cast when they've unfortunately found themselves in a similar situation. With each, I have tried to share some of the ideas that worked for us in hopes that it would help other families after such accidents. While I hope this isn't needed for many of you, it would feel that good came out of the situation if this post could be shared, saved, and referenced by families who do need the added insight from a fellow parent who has been in their shoes. Here's to safe childhoods, healthy kids, and yet adaptable, optimistic approaches to all that parenthood throws our way! When my husband initially called me on the way to the ER, I knew by my daughter's screaming that 1) something was not right and 2) there was no time to waste. I packed my youngest up in the car and we jetted to the emergency room just like any other parent would in this situation. What this meant though was that we came home to an environment that was far from "ready" for this type of unexpected event. Initially, there was a sense of survival mode that allowed me to overlook typical boundaries on screen time, changing out of PJs and into "real clothes," and flexibility around allowing more snacks given upon request (versus our usual snack schedule) and admittedly as rewards for taking medication or doing necessary things amidst obvious discomfort. Once we moved beyond that first weekend with the splint and then cast though, I knew that we would be relying on certain essentials for both our four- to six-week survival and sanity. We received a Regalo My Cot over six months ago and have enjoyed it in several applications since. The girls love to play with them, build forts with them, and put them out for movie night, but never have they proved as practical and useful as when my oldest broke her leg. Low to the ground and an easy option to put out or move about, our My Cot was a comfortable place our daughter contently rested often while in her cast. I appreciated I could easily lift her on and off of it, and eventually when she was able to move more, it was the most appropriate resting place for her to lift herself on and off of. I also appreciated that it had a fitted sheet (unlike our couch cushions), so that my daughter could eat and drink on it without me having to worry about the mess. I truly found it more helpful than I had ever imagined when we were in this situation and would genuinely recommend it as something that repurposed to serve us in this season so well. For anyone wanting to send a gift to someone who just broke their leg, this is one of those items parents in that moment may not think of but would greatly find use for. Our girls love doing breakfast in bed on holidays, so having this style tray around already proved extra helpful during the many meals we ate around my daughter on the floor. Since she couldn’t sit in a normal chair at the dinner table very comfortably, we set up family picnics on the ground and allowed her to use this to prop her plate up and balance it over her lap while sitting up on her My Cot. Sometimes you just have to adapt, and that’s exactly what we did when it came to meal times. It didn’t feel right to have my daughter eat alone on her cot while we all sat at the table, so we used a large blanket spread out in the living room to all sit on at meal times. The three of us either used the coffee table or the ground for our plates, while my oldest was able to gather around with us using her tray+cot combo. Nothing makes a family stir-crazy like not being able to let your child play outside during the start of Spring. To curb these feelings of being on house arrest, we took daily walks with the double stroller. We love and constantly use this one. It allowed us to not only get out and enjoy fresh air but also to see neighbors and have a change of environment without expecting anywhere to be conducive to a child in a cast. As always, be sure to consult your doctor and follow medical advice based on your child's unique needs and plan for recovery. Whether it be encouraging your child to walk or just the woes of trying to sponge bath them without getting the cast wet, it goes without saying this season takes a bit of extra patience. With many challenges in parenthood though, I just try to remind myself how grateful I am that this is truly so small compared to what other families face. 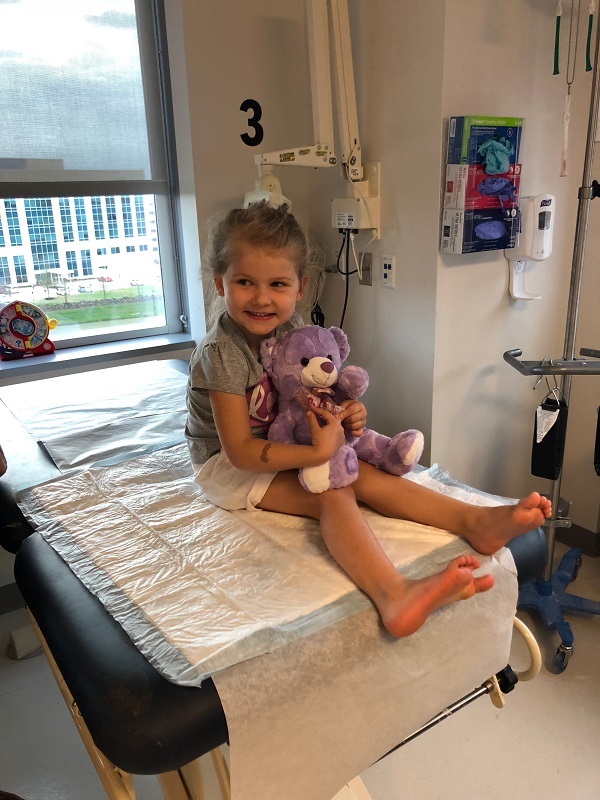 A quick look on Instagram at any family who is facing #childhoodcancer, #cysticfibrosis, or #nicubaby, usually gives me that added bit of insight I need to remain patient and keep this stint of inconvenience in perspective. I wish I remembered who advised we do this so I could personally thank them, but the tip to encourage my daughter to crawl before expecting her to walk was hugely helpful. Not only did it take some of the work off of me from having to carry her everywhere, but it was a HUGE boost in her own morale when she realized she still could move from place to place by using a crawling maneuver when needed to reach another toy or shift how she was sitting. The My Cot was our BFF for many weeks, especially when Claire was unable to lift herself up onto a chair or couch. It also was a good step in between being carried and placed onto anything and her learning how to get up onto something on her own. Helping her practice how to both climb to then crawl up onto a raised cot/chair/couch helped her to develop more confidence with how she could safely regain mobility and independence. The irony of having my daughter break her leg on a trampoline (not ours), was that our own trampoline lives in our formal dining room (because who uses "formal" anything with kids anyways, right?!). It acted as the perfect place for us to practice "doing laps" where my daughter could hold onto the trampoline with one hand and onto me with the other. We would do circles around it as many times in a row or over the course of a day as she felt up to in order to help her establish confidence with hopping, then tip-toeing, then lightly stepping, and eventually walking on her foot as possible. Having one friend over at a time was really uplifting to our daughter in her recovery. Any more than that became a bit much when she couldn't move, but one friend seemed to be a good number to have around to play with when stationary. It also helped act as an incentive to getting our daughter to apply safe amounts of pressure onto her leg again to move. While I was there to help her as needed, nothing made her want to be independent like having a friend over who on their own was. It was almost as if when it was just our family, my daughter didn't mind being waited on. But when a friend was there and prompting, "Come on, Claire, let's ... (something that required her to move)" my daughter recognized a heightened desire to be able to play and act more independently again. This is in no way a comprehensive summary of everything our life entailed for that month with my daughter in a full leg cast, but I hope it will lend as a helpful resource to other families should they find themselves overwhelmed when initially in a similar situation!